I had a hard time deciding if I should trim no flesh and bulbs at all and let 'the customer' do all the work himself, or trim, cut and drill all of it before shipping. I could psychologically not bear the idea of sending all those very raw casts with flesh plates as big as the rubber molds square blocks size because often, casted parts break or get damaged during trimming and cutting from the 'sprue-sheet'. At my home I can replace them for another cast. Once shipped I can not. So thats why I tried to do most of the trimming myself. Kostis Ornerakis wrote: The dowell shall penetrate through the sides of the boat. I think also braces could fasten here. That looks like a proper solution. Good idea to use it for the braces too. Kostis Ornerakis wrote: One edge inside and one outside the boat. I am not sure what you mean by 'one edge inside the boat'. 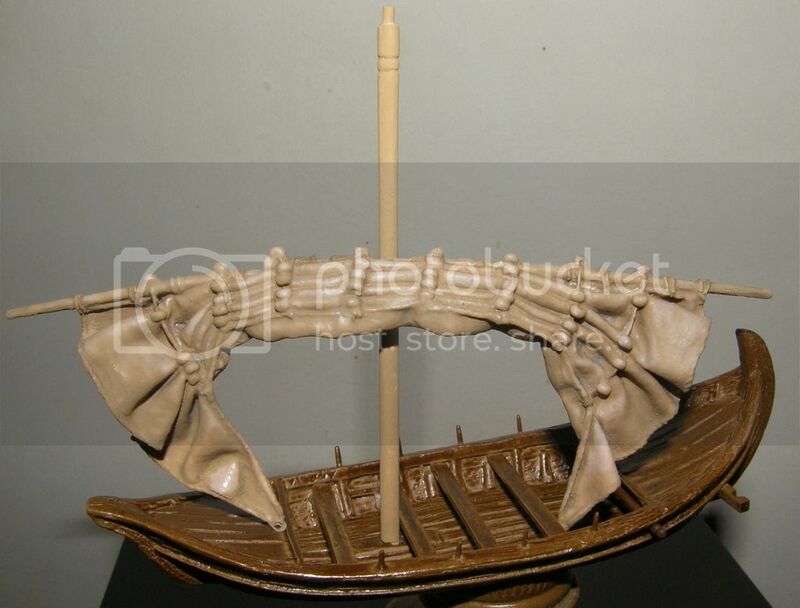 At your plan "rigging of the sail" for the Uluburun ship you attach a block at the end of the sail. A line(brace) pass through the block and has 2 edges. I am thinking to fasten one end in a notch on the piece of dowell which is outside the ship. And the other edge fasten inside ( with some extra rope hanging). I am not sure where to attach the sheet lines. In your plan it seems like a good solution is the bench near the mast. May be I could attach them also at the dowell for brails/braces. I follow this topic with much attention, although it's not my period nor is the sea my battlefield of interest. Which is a bit strange, because I live very close to the North Sea. This remark brings me to a small question in between, if the gentlemen allow me? Mr. Cryns: do you live by any chance in Den Helder, just as I do? Kostis Ornerakis wrote: A line(brace) pass through the block and has 2 edges. Okay thanks for your clarification. I understand it now. I think it is called rope's end instead of rope's edge ( I thought you were talking about that dowel/horizontal beam). But your plan sounds perfect. About attaching the sheet lines: it depends how yard and sail are positioned: transverse, diagonally or in line with the ship. So I have to leave that up to you. Do you think it would be possible to soften the lowest corner-tips by heating the whole sail in the oven and bend them into the direction the sheets run? marc zijp wrote: you live by any chance in Den Helder, just as I do? Dear Marc I live in Amsterdam. My favorite part of the barge is the sail. Instead of priming I have washed it with the same colour. I have to work with the crew now. Kostis it is hard to believe this object was the same one that was made on my dining table. I see details I did not know myself! But its because you did some very precise trimming The horizontal pole/beam you added (though partly obscured) looks good and a very credible solution for a rowing vessel equipped with a sail. It will be perfect for fastening buntlines/brails and braces. I should make one myself and add it to the resin model A very good addition of yours. And the yard is bended so extremely . Did you do that? It looks great. Kostis Ornerakis wrote: I have to work with the crew now. 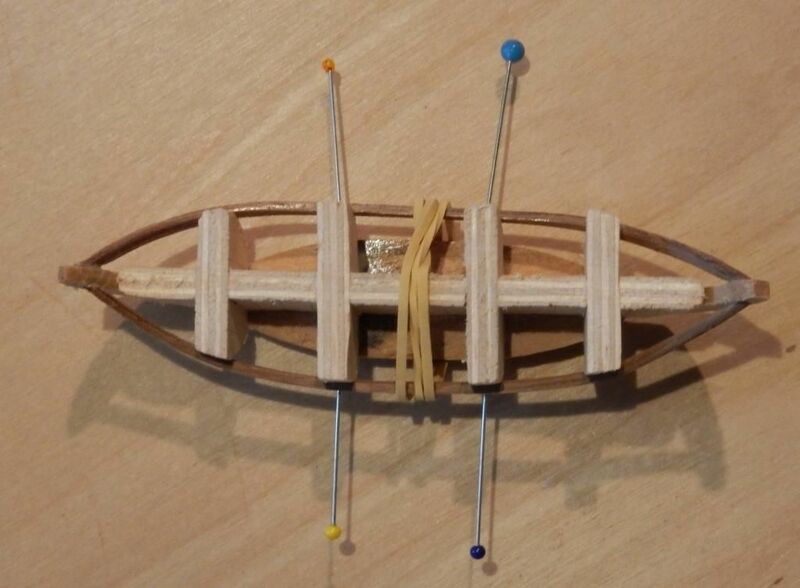 Meanwhile I am building a new boat, much smaller than this one. It can be rowed by just one man. Mr. Cryns wrote: And the yard is bended so extremely . Did you do that? It looks great. I followed your instructions. The only difference is that I heated topically with my wife's hair dryer. 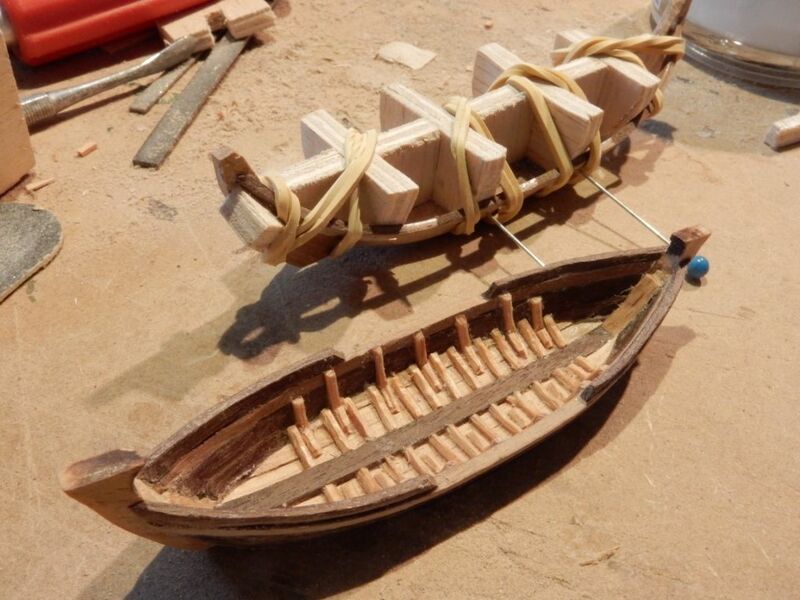 Mr. Cryns wrote: Meanwhile I am building a new boat, much smaller than this one. It can be rowed by just one man. Fantastic news! Can you read my mind? These are the first 3 figures. Your use of the Orion head means we can expect some Orion rowers? Kostis Ornerakis wrote: Can you read my mind? No not at all. You want more boats? The new boats are wonderful. Mr. Cryns wrote: Your use of the Orion head means we can expect some Orion rowers? No but please wait for 1-2 days. Mr. Cryns wrote: No not at all. You want more boats? I am afraid YES. But we'll talk after my running wips. There are 3 sets of rowers to my knoledge. A set from Orion, a set from Frankzett and finally a 3D printed from Shapeways. (Panzer vs Tanks). With the new prices in Shapeways DON'T try even to search for the last. The problem with the Orion set is that the arms need adjustments. Frankzett's set has a clever solution for the hands, but is rather a slim figure WITH a bench casted with her. So after some time consuming and unsuccesfull experiments, I exchanged emails with Mr.Cryns. That was really inspiring, because I have the idea after them. To take the advantages from every one. And as usual the simplest is the best. 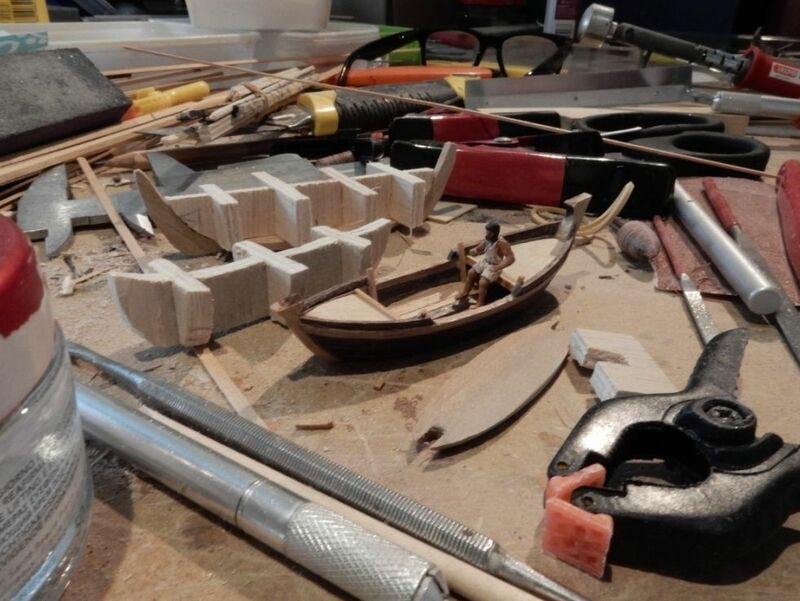 It is always a pleasure to look at the posts in this thread: Kostis' project is making great progress, and the prospect of more ships by Mr. Cryns is awesome! Meanwhile, I am also the proud owner of one of these ships, but I have presented it in the "my latest purchase" thread - not here in the WIP section, because I have no progress whatsoever to present. 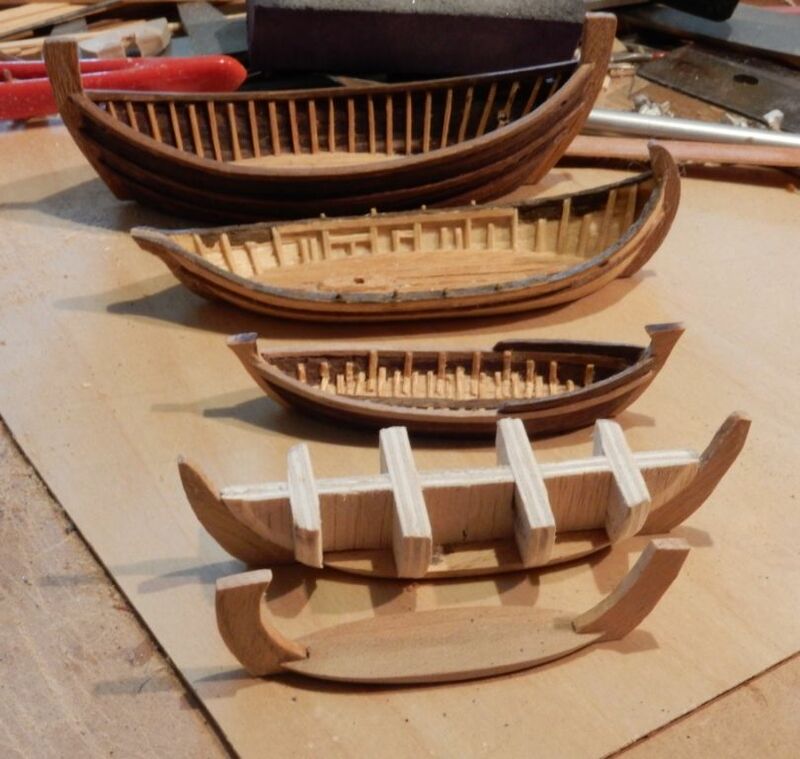 Talking about rowers, I have the sets by Orion and by Frank Ziegler, although both have been never used yet in any of my projects. It will be interesting to see how they fit together. The Panzer vs. Tankls set is ... well, the price of €901.44 must be a joke, doesn't it? 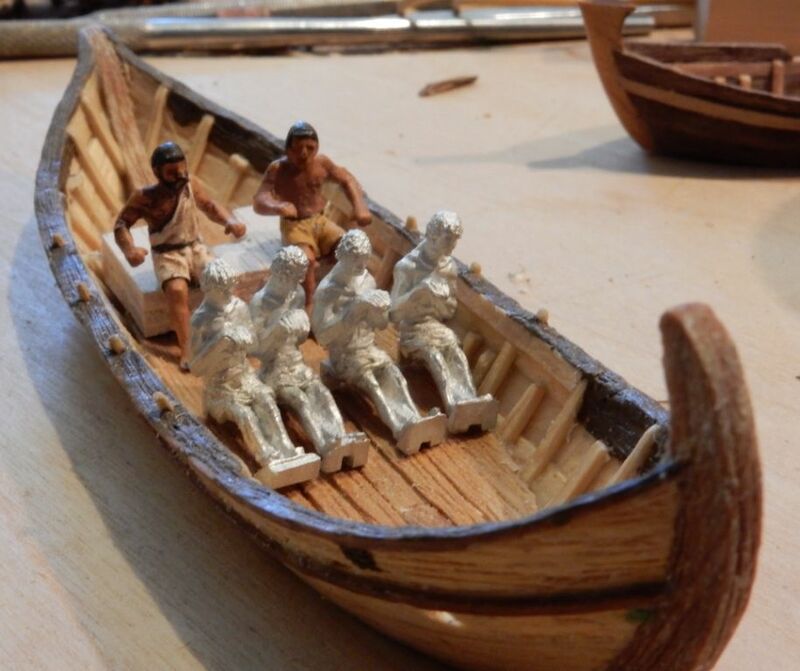 But besides the cost, this set is simply unusable for antiquity: Those rowers have shackles at their legs, which fits the modern cliche that they were slaves chained to their ships - and that's one of Hollywood's fairy tales. Dear Kostis and sberry, thanks for discussing the rowers issue. 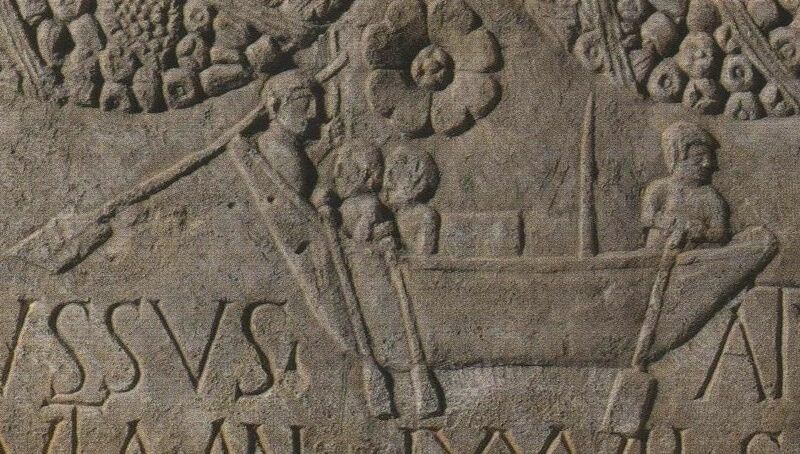 sberry wrote: unusable for antiquity: Those rowers have shackles at their legs, which fits the modern cliche that they were slaves chained to their ships - and that's one of Hollywood's fairy tales. Kostis Ornerakis wrote: To take the advantages from every one. And as usual the simplest is the best. 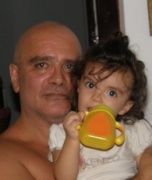 Kostis thank you so much for this very good and credible solution! I did not think about this. 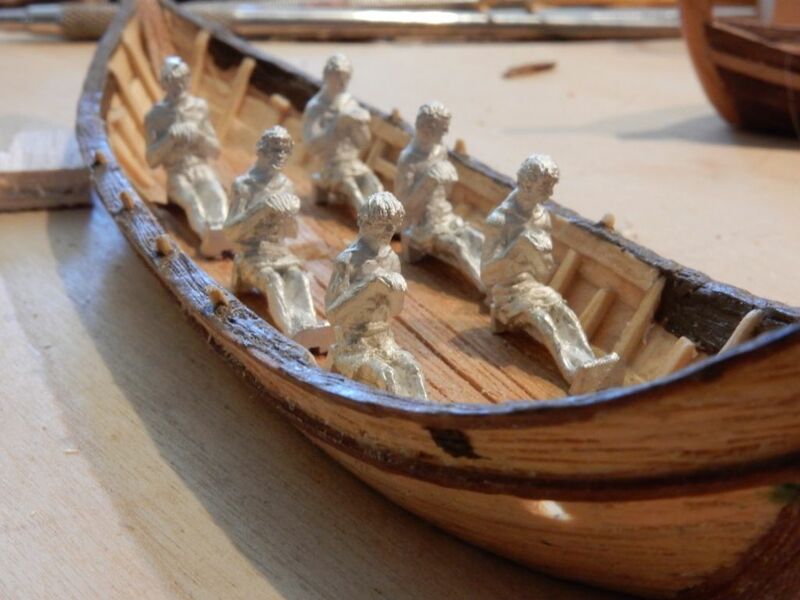 I think these metal figures are perfect for the small, crammed space inside a galley with several levels for the rowers. Also their seats/benches make them perfect for that. I wish I could turn back time and add these inside of my 160 crew trireme. So I wonderd if the Frankzett rowers, having their legs stretched forward already, could be used with their feet on the benches before them after removing their seats and feat-rests. But most of the rowers in these pictures have their legs spread a littlebit or even a lot. Time to cut and bend one of those metal rowers. The frame was so a-symmetric I decided to destroyed it and make it all over again. More ribs were added and shaped in raw, lively pieces of 'vintage'-wood of which so many cheap traditional vessels were build. Ribs all over makes it possible to use this boat without the front- and aft decks so there is possibility for variety once more. 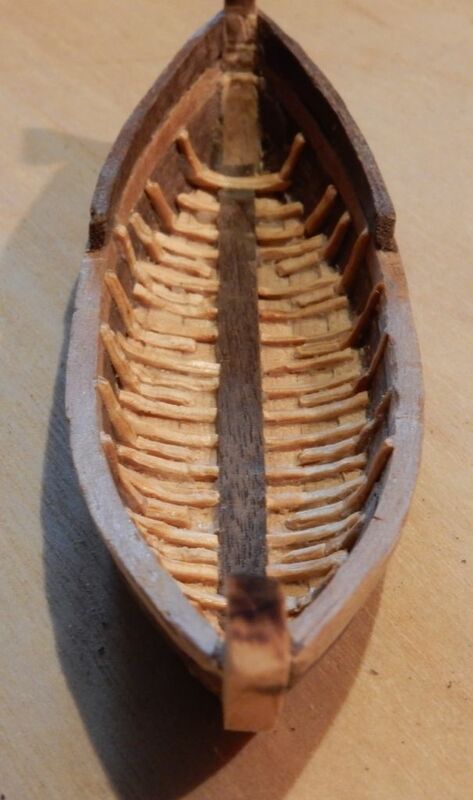 I will cast this boat only after I have some more prototypes ready so I can do it in one go. I am getting exhausted of changing my home studio from woodwork bench into chemical laboratory and sculpting studio again and again so I try to stay to one of them as long as I can. None of the metal rowers - let me say nice is an eye catcher. 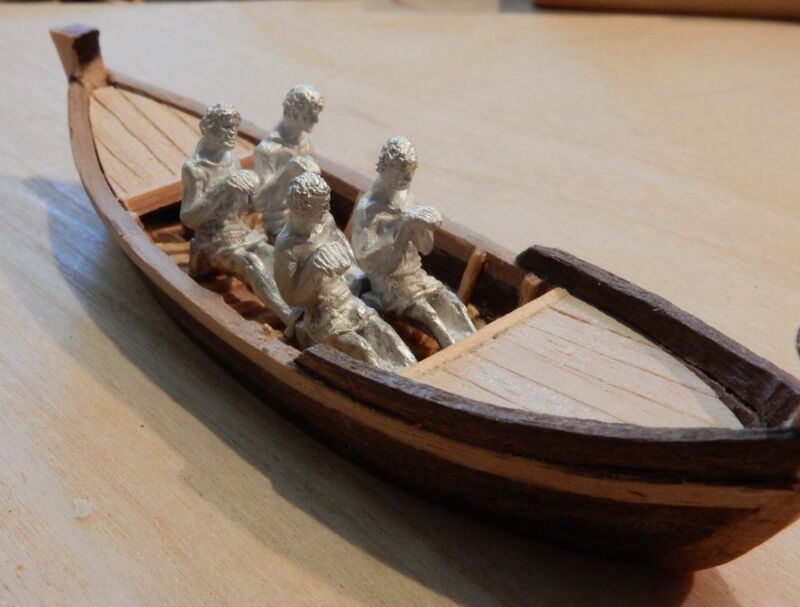 The four in the Gallo-Roman ship are fare much nicer in pose! I ran into the same trouble with my Dio: Opfer für Neptun. 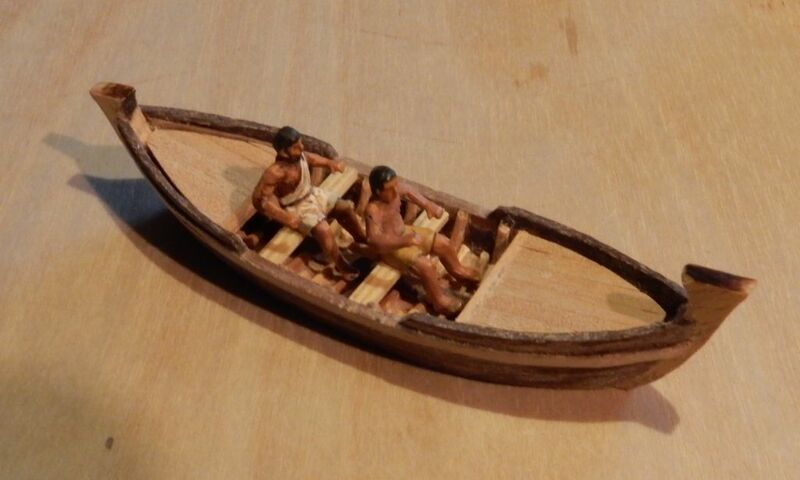 Trying with Dragon, Preiser and Waterloo segment figures to do rowers in action very first. With no pose I was satisfied. So I simply let they all sit and wait for one. 1. So you have to do a set of rowers. 2. Rowers in a little bit different pose. No mono culture . 3. For right and left side ( Non nautical ). 3a. A few with stripes at the back for point No.:6 . 4. And a double rowers. With different angle of the arms to work the paddle. 6. Very important, and this is new, a women! who do crack the whip . Your pic with the Indian fishing boat is useful. I have to store it. Well, I feel like Columbus if he knew Vikings discovered America before him. Not eye catching at all. Before anybody asks why using Orion's resin copies, I have 2 advantages. Much easier trimming and painting and slight modifications by angling torsos and heads. Of course after the boat is painted and oars are painted and in place, some small modifications with the biceps of the rowers will be needed. With this post my contribution to my very good friend's thread comes to an end. Mr. Cryns thank you for hosting, it was a privilege and a pleasure. 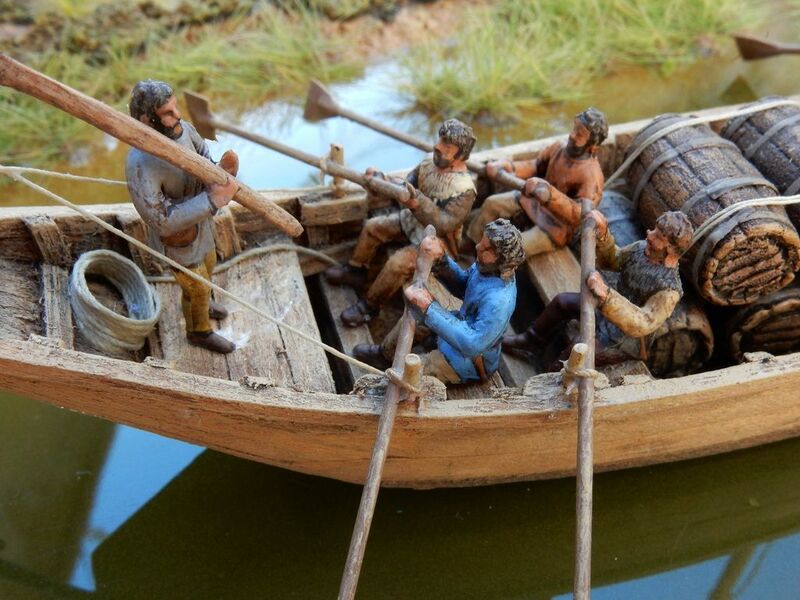 These jaundice seamen look promising. But they are in urgent need for spinach for there biceps. I hope the Preiser lady have some in her bag!